Newt is making a pitch aimed at the cultural and racial animosities of conservative whites—and it may be working. 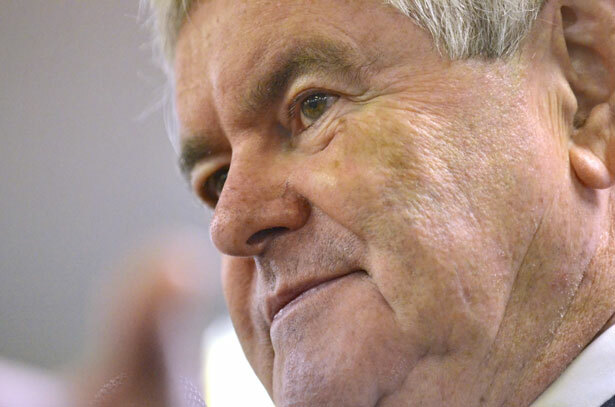 Columbia—Newt Gingrich looks poised to become the conservative alternative to Mitt Romney in the crucial South Carolina primary. The most recent state polls all have Gingrich in second, although some show the gap between him and Romney widening. And Gingrich’s campaign is quick to point out the most encouraging, if obscure, cross tabs, such as Public Policy Polling’ finding that Gingrich was the top second choice among voters and the candidate they most trust on foreign policy. Liberal writers argue Gingrich’s rhetoric—calling President Obama “the best food stamp president in history” and so forth—is a dog whistle designed to appeal to South Carolina’s white Republican voters. This was the first state to secede from the Union. Surrounding the state capitol building there is a street named for slavery defender John Calhoun, a statue of segregation defender Strom Thurmond and a Confederate flag flying. Veteran South Carolina politicos readily agree, off the record of course, that Gingrich is intentionally tapping into this long vein of racial animosity. In the years since the Civil Rights Act, white South Carolinians may have largely ceased pining for the days of segregated water fountains. And anyway, no politician can call for returning to them. But they often resent African-Americans and social welfare programs that they view through a racial lens. Gingrich, who held a Congressional seat in neighboring Georgia, is playing to that sentiment more effectively than his opponents. When I asked Governor Haley, who is supporting Mitt Romney, whether Romney’s Mormonism would be an obstacle to him winning South Carolina, she claimed her own election proved the state’s electorate no longer harbors any bias. “You’re talking to someone who was just elected in South Carolina as an Indian female,” said Haley, “I don’t think that’s going to be a problem.” But South Carolina Democrats say that Haley won by running against President Obama. The Republican Governor’s Association, for example, ran a commercial calling Haley’s opponent, Vincent Sheheen, “an Obama liberal in our own backyard,” that showed Obama, in shadow, transmogrifying into Sheheen. Those ads, they say, played to racial animosity towards Obama and were crucial to Haley’s relatively narrow win. It’s actually a brilliant piece of jiu-jitsu: Gingrich plays to racial animosity while claiming credit for trying to empower poor minorities. When Gingrich says, as he does at every stump speech, that his message of “jobs versus [President Obama’s dispensing of] food stamps,” will appeal to “people of every background,” he sounds like he is actually offering a vision for a broader, more diverse Republican Party. Gingrich told the Chamber of Commerce that such a message would be so potent in the general election “there would be no safe states for President Obama.” But at the same time Gingrich is appealing to whites, particularly in South Carolina, who may tend to feel that minorities are freeloaders. When he says black parents will take him up on his offer of jobs instead of food stamps, some listeners might hear “get blacks off of food stamps,” particularly when it comes after his boast of having passed welfare reform.